A session of Fungi is a fun enough time but it’s not as good as a dozen or more games with approximately the same time investment. We gave it two and a half stars – it’s absolutely fine, but nothing that we hunger to taste again. Perhaps we just don’t like mushrooms enough, but I suspect there are probably vanishingly few people that would be so invested in the paper-thin theme that it would sway them one way or another. As usual though if you cared what I thought about the gameplay you’d be reading the review. Here, our requirements are different – we want to know whether you can go down to the woods today. Let’s see if we’re getting a mouthful of morel or a gut full of agaric. No game state is presented where colour is the only information channel. That’s not to say colour blindness isn’t an issue, but that it’s one that is easily overcome. 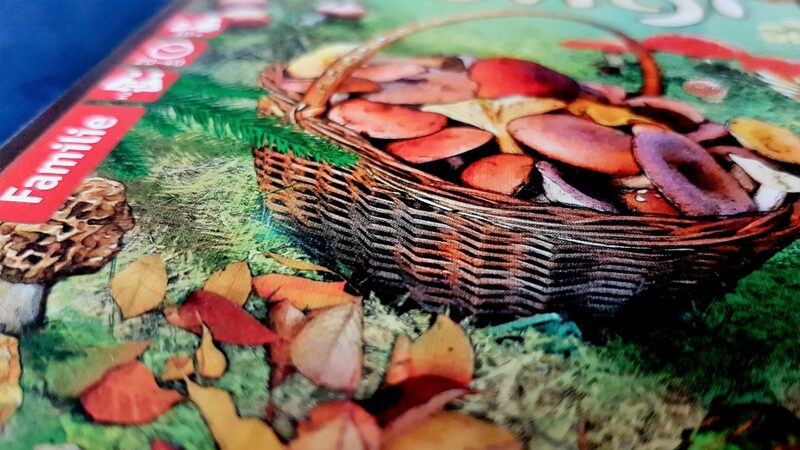 When viewing the cards through the lens of colour blindness, one thing likely jumps out at anyone with full trichromatic vision – the colour cues that differentiate the mushrooms are much less distinct when everything is tinged with the melancholy gold of an autumn morning. 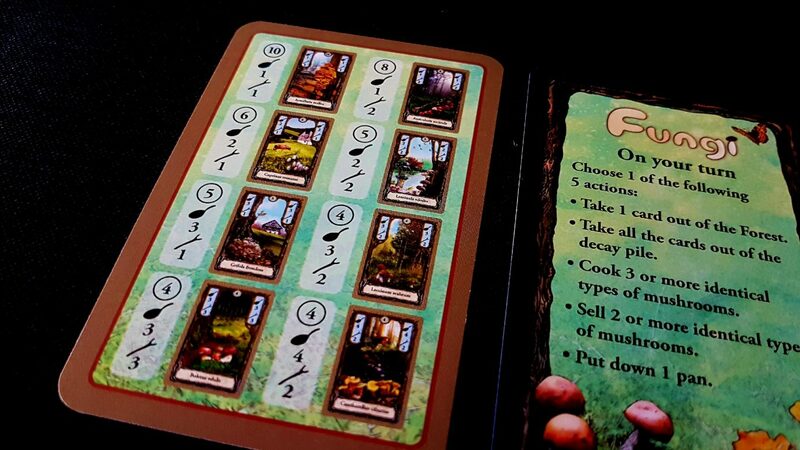 Every mushroom has its name prominently displayed on a plate at the bottom of the card, but these aren’t very memorable – that’ll be true at least for the first few games you play. The artwork is definitely distinct enough to tell one from another, but I think it’s a little more difficult to identify sets when the colour composition is less markedly different. As I say though, no information is lost, and Fungi absolutely can be played regardless of category of colour blindness. This is true all the way up to monochromacy. We strongly recommend Fungi in this category. 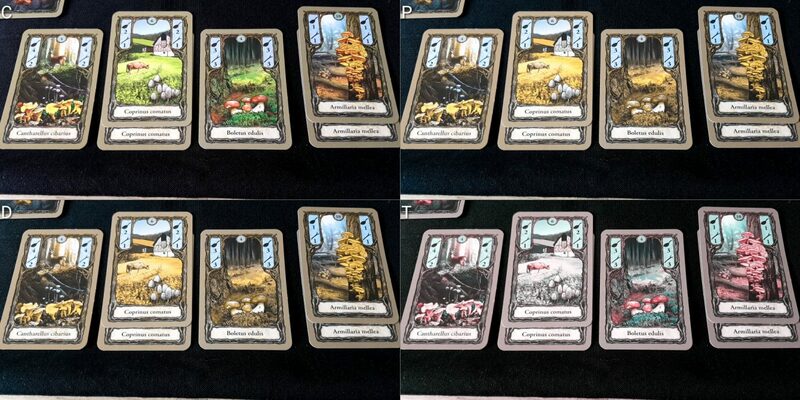 All of the mushroom cards have well contrasted information panels that are consistently presented. The number of equivalent cards that are available in the deck is always shown in the top centre, the points and stick values are in ribbons at the top left and the top right, and the name of the card is always at the bottom. Provided some ability to discern visual information with an assistive aide is present, the game is likely playable. At most, you’ll be considering one of eight cards on your turn (or as many as four if you pick the discard pile) and more often you’ll be choosing between two unless you have sticks to invest. The state of the forest is open information, and there aren’t enough cards that you need to leak game information to inquire what’s there. 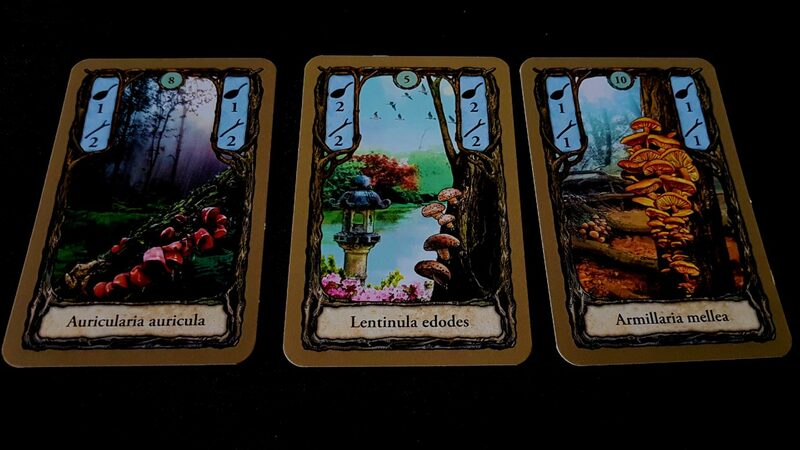 Asking ‘Are there any morels coming up’ might reveal your intention, but asking ‘What are the next six cards’ is less likely to reveal anything to another player whilst still remaining a small enough information burst to be tractable. The game also has a recommended alternate layout that condenses the cards in a neater and more easily explored compact form. This is going to depend heavily on how severe someone’s visual impairments are likely to be, but consider the boletus edulis and the leccinum scabrum in the bottom left. The artwork, while notably different, shares a considerable degree of aesthetic overlap. Both are identified by being a forest scene, of roughly equivalent palette, where white stalk mushrooms with red caps are present in the bottom of the scene. With the morchella esculanta and cantharellus cibarius, they’re both wooded scenes with yellowish mushrooms at the bottom. The coprinus comatus and grifola frondosa are characterised by white mushrooms in the bottom and a house in the distance. I’m not saying you can’t tell the difference, because that’s obviously not true. What I’m saying is that if viewed as a blur at a distance they’re likely to be the source of some uncertainty. Close inspection will reveal the truth, but close inspection takes time and effort and risks disclosure of intention. The other cards are better in this respect. 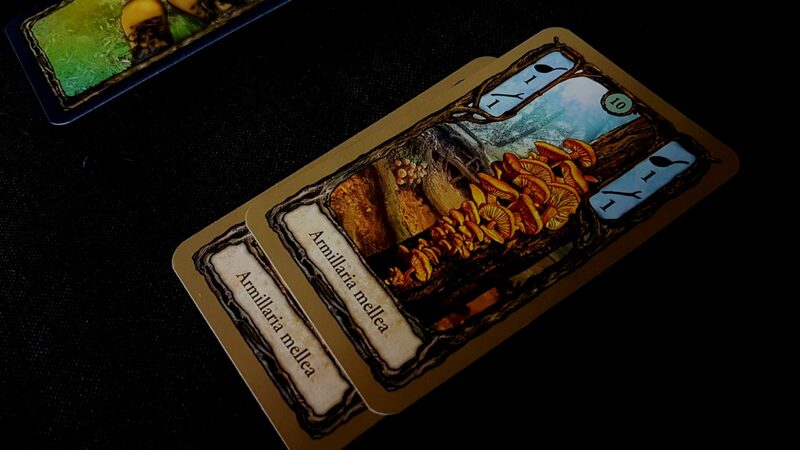 The nature of the forest and the ‘duel’ style of game also means that cards are going to end up erratically oriented as they make their way through the forest. Either they’re drawn and played in whatever orientation they are in the deck, or they’ll be angled towards one player and not the other. This can make the text on the bottom more difficult to read, although in the scenario where only one player is visually impaired it’s simple enough to ensure they always have the easier job of making out the names. Or of course you can just sit side by side if you have a table large enough to support two display areas. Overall, we’ll recommend Fungi in this category but bear in mind there is an increasing administrative burden the more severe a visual impairment might be because of the similar design of the mushroom art. Fungi puts more of a burden on memory than it does on fluid intelligence, but it does have a degree of mechanical complexity that is associated with state management. For one thing, you have a set of five actions to choose between, and the impact each has might vary from round to round. Collecting fly agaric for example is rarely desirable unless you need to do some pruning of mushrooms from your hand. Selecting a pan is only worth doing if you’re going to be cooking enough mushrooms to make it worthwhile – the act of getting a pan in play is a two round process. One round to collect it from the forest, and the other to play it down. Baskets have as much value as your hand-limit dictates, and when you collect one of those you’re not collecting points. It’s never a bad thing to have a large hand limit in terms of value, but it can be wasteful in a game that is about efficiency of turns. Claiming the discard pile might yield one card, or might yield four. You might be able to do it, or not, depending on what it contains – if you have a hand limit of ten and eight cards in hand you can still claim the discard pile if it contains at least one basket. No individual element of the game is especially complex, but there are intersections of situational complexity and value processing that arise at regular intervals. Memory is more important in Fungi because knowing the value of a mushroom depends on knowing how many are in the deck (a value clearly displayed on each card, and on a reference card each player gets – that’s great) but also on how many have been collected and discarded. The morel that passes by might be worth eighteen points (if you know there are two to come or there are two in your hand) or worth nothing (if you know the other player has the other two). The cognitive cost of holding an estimation of the cards an opponent has will rise over the course of the game – the hand limit increases in line with collected baskets. You don’t need a perfect understanding to achieve good results, but you do need to keep in mind the key and important elements of the emerging mushroom economy. Hands of mushrooms are hidden, but technically speaking the discard is available for someone to consult if needed – that’s not going to be ideal though if it has to be done regularly. Repeated querying of the discard pile too is going to make the other player wonder what it is that’s got you so invested in probability, and that may impact on your future strategy. There’s a considerable degree of numeracy involved in play, both in terms of keeping track of how many mushrooms of each type remain available and also with regards to calculating potential point yield and even doing the arithmetic of scoring. Scoring two day porcini along with a night porcini and a dab of butter earns you 3 + 3 + (2×3) + 3 points. The distinction between day and night cards adds a conditional complexity here. The scoring for mushrooms happens at the end so it need not be calculated by any individual player – the problem is that knowing how and when to score requires this calculation to be done regularly and with reference to a probability window that will narrow as more information becomes available through exploration of the forest. Literacy too is an issue because there’s a quirky approach taken to the naming of mushrooms. In what seems to be an attempt to offer textual information in a language independent way, all the mushrooms are presented with their scientific, Latin names. A translation is available in the manual, showing that Boletus Edulis are more commonly known as porcini, and Lentinula edode are generally called Shiitake. That’s educational in its own way, but it creates a literacy issue for everyone that doesn’t automatically know the scientific terminology. True, you only need to know the mushrooms by value. When you’re looking at one picture of a mushroom and comparing it against the mushrooms you already have though it would be nice if there was a less cognitively expensive way to identify by name. This is especially true because many of the pictures are just ‘some type of mushrooms growing on a thing’. Strictly speaking literacy isn’t needed but the game still manages to add a literacy cost to the process. Overall, we’ll offer a tentative recommendation for Fungi in the fluid intelligence category, but we’d advise those with memory impairments look elsewhere for enjoyment. While players in Fungi often steal mushrooms away from each other, it’s not a particularly competitive game. You spend more time focusing on what you want rather than what your opponent is doing – in many respects they’re more like an automated pricing algorithm than a real part of the game. There’s no player elimination, an equal chance for both players to participate, and as it’s an exclusively two player game there’s no ganging up on a runaway leader. Score disparities can be significant but they’re also a function of the willingness someone has to gamble. If you try to grab morels you’ll be investing a portion of your hand-limit, long term, on the chance of a reward that may never come. It’s entirely possible to see the mushroom you need enter the forest and know, by simple computation of the options, that you will never be able to get it. If your opponent knows that you are seeking morels, they’ll do what they can to deny you the opportunity. It’s not always going to be possible but it does mean that if you go for high scoring cards you’ll often find yourself coming away with zero points as a reward for the risk. More conservative strategies (such as gathering the easy mushrooms that are widely available) offer more consistent, less spiky scores. Both options are viable, but one playing against the other will likely mean someone makes out like a bandit while the other languishes with only a plate of soggy discards for dinner. Luck plays a significant factor in this, but if that’s a concern you can play it ‘best of three’ style to help even that factor out. All of this is to say that the emotional cost of play is dependent on the extent to which people like to gamble, and how well they take losing their stake. We’ll recommend Fungi in this category. Hand management becomes an increasing issue as time goes by – it’s possible, although not likely, that you’ll end up with a hand limit of eighteen if you collect all of the baskets. Card holders, and several of them, are going to be necessary for comfortable play. Cards, when collected, tend to stay in hand unless you cash them out for points or sticks. That permits a reasonable pace of change that is more comfortable than the repeated churn associated with many card games. However, by far the largest and most intense physical interaction of the game comes along with managing the forest. Every time someone takes an action, the rightmost card decays. You’ll need to keep track of how many cards are in the decay pile before you do this and discard if there are four. 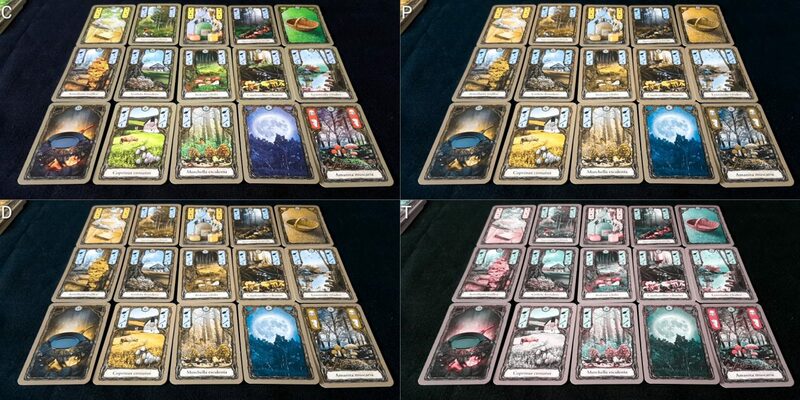 Then, you need to shuffle all the cards in the forest up one (or more) spaces and then deal out replacements from the deck. That happens every single turn, and while it doesn’t sound onerous it is a massive pain in the hole even if you are fully physically able. Many games make use of this ‘things become cheaper as times go by’ mechanic, but no other game we have discussed so far on Meeple Like Us does it so regularly, and for so many different cards at a time. 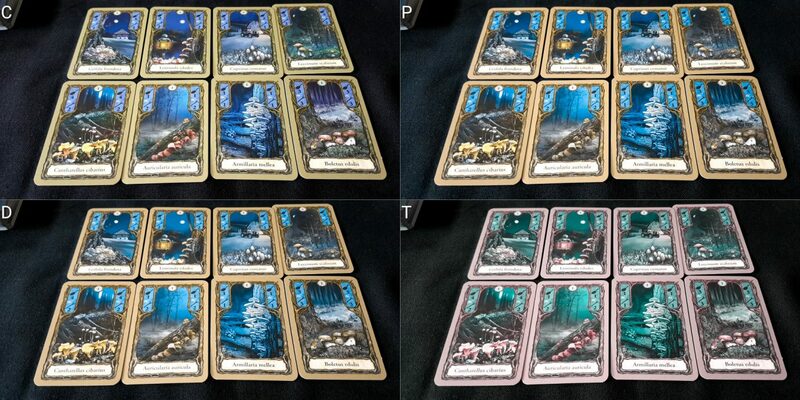 The alternate method of forming the forest can be used here to restrict the forest to six, rather than eight, cards. That alleviates some, but by no means all, of these concerns. This is going to be fine if someone playing is capable of doing this, but remember too Fungi is a two player game. The chance of there being someone able to act on another’s behalf is dependent on group size. With two players, 50% of the players at best will be able to act on the behalf of a physically impaired player. If there are four players, then the percentage ceiling on that rises to 75%. The amount, and nature, of the constant flow of the forest is a problem. So too is the shuffling of the deck – there are 86 cards in the forest deck, and these need to be shuffled carefully each time you play. As with Jaipur, or Lords of Vegas, the nature of the way cards are discarded tends to mean sets clump together. If you aren’t methodical in shuffling you’ll end up with a game where groups of cards will tend to come out at the same time. The cards are a comfortable size for shuffling, but there are more of them than in a standard poker deck and the number of times you’ll need to shuffle at the start might be a physical interaction issue of its own. Verbalisation isn’t a problem – you can unambiguously reference any part of the forest by number, and the act of selling or cooking mushrooms is as straightforward as saying ‘cook my third, fourth and fifth card in the pan in front of me’. All the other actions are easily stated and enacted. We’ll recommend Fungi in this category but bear in mind that a two player game offers fewer opportunities for collegiate accessibility support than a larger game. In such cases, you’ll almost certainly want to make use of the alternate layout. I have no worries here. The theme does not touch upon any issues of representation, and the manual is written in the first person so avoids defaulting to masculinity. There’s no sexual content, and no troubling thematic elements. While I may have suggested in the review that the forest of Fungi was a drug-addled fear factory that was something I entirely projected onto the experience myself. It says more about me than it does about anything in the box. The game has an RRP of £10 – it only supports two players, which isn’t a great ratio of ‘players per pound’ but its overall cost is small enough that it’s a low risk proposition for inclusion in a game library. 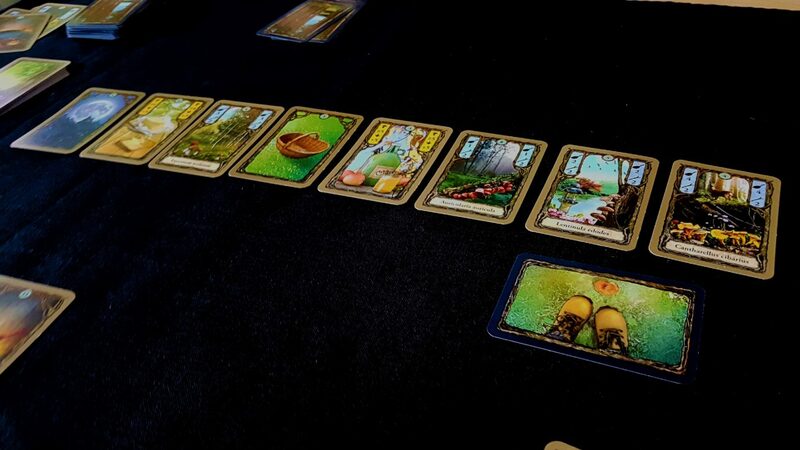 There are games that offer larger player counts for less money (such as Port Royal in the same Pegasus-Spiele line – we’ll talk about that one soon) but this isn’t a price point at which you can otherwise acquire many modern designer games. Fungi is perfectly enjoyable, but for me its main flaw is that it’s not more enjoyable than many other games I own in the same complexity/time space. If you don’t have that problem, I suspect you’ll get a lot of long-term enjoyment out of the box – certainly enough to justify the expense. There’s a small literacy issue in that the game cards include text, but it’s presented in a scientific Latin format that it’s reasonable to expect nobody will be especially comfortable using. As such, it’s still a level playing field. The language used isn’t necessary for play since the mushrooms are identified by art as much as they are by name. Otherwise, you can play in absolute silence although I’d recommend smacking your lips together every time you fry up some mushrooms. Just, you know, because. If visual impairment intersects with colour blindness, then identifying individual mushrooms is going to be exponentially more difficult. The art isn’t overly differentiated from mushroom to mushroom and it uses colour as a useful channel of additional information. Without that, close inspection of each card is almost certainly going to be necessary. A game with hidden hands of cards almost always triggers issues at the intersection of physical, visual and cognitive impairment but here an interesting thing has been done. Your hidden hand will consist of mushrooms, butters, ciders and the occasional pan. Some of the more cognitively expensive cards (pans in play, baskets, fly agaric) have been separated out into a display area that is kept open to everyone. While this doesn’t solve the problems that may arise from someone needing clarification on the specifics of a secret card, it does limit them quite considerably. It’s a neat game design element that I haven’t seen done in this way previously. 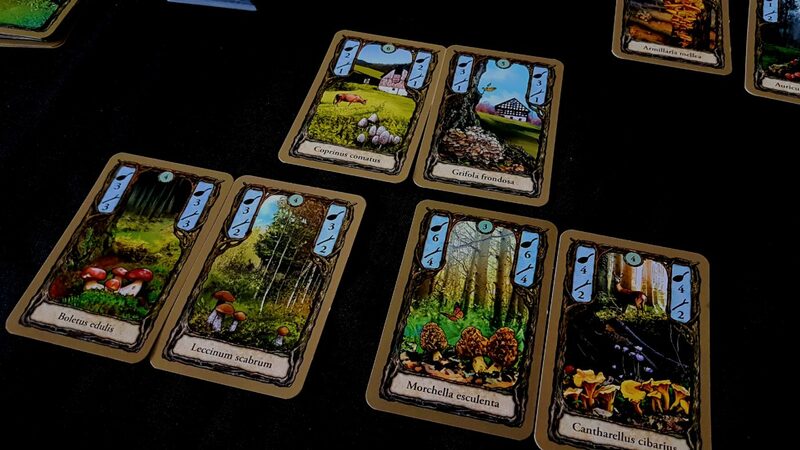 At thirty minutes or so of play, Fungi is a quick enough game that it’s unlikely to exacerbate issues of discomfort. That’s good, because it’s a two player game and if one player drops out the game is over. There are no meaningful mechanisms that can be used to finish the game solo. Luckily the accessibility teardown here doesn’t leave a bad taste in our mouth, and there are some nice elements that really do make a difference. I love the fact the game has its own alternate setup for the forest that limits both the sprawl of the cards, and also the amount of physical manipulation. The bifurcation of the hand into public and private areas is an element of the design space that has a lot of potential from an accessibility perspective. 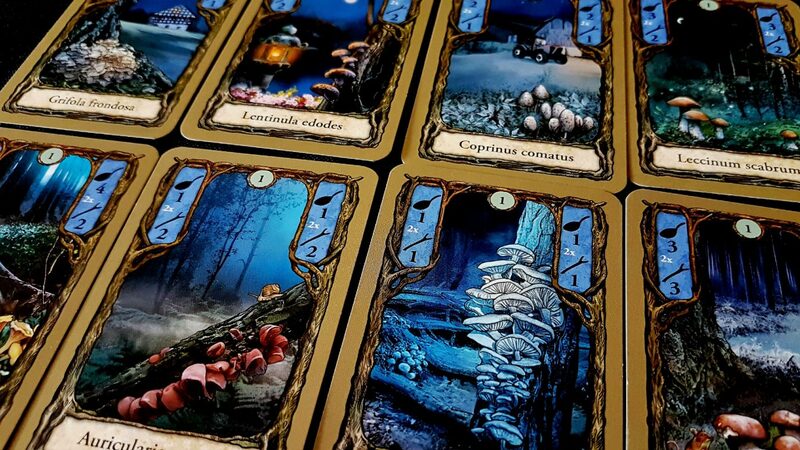 While Fungi does have some accessibility considerations that would keep us from recommending it too broadly or liberally, it’s also something that is going to be playable by a wide swathe of people. We discussed in the review how Fungi is a sub-optimal prospect for me because I have many other games that are better that I’d rather be playing. It’s a decent game, it’s just that decency is a bar that is far too low to merit much attention in the current gaming landscape. Accessibility issues though make that a far more nuanced consideration – just because a game is better doesn’t mean it’s playable. As such, while I am not overly enamored with Fungi I think you could have a perfectly enjoyable time in the forest if other alternatives are not available.